This is the ultimate restorative yoga pose. Also known as Balasana, this position releases back and neck tension, alleviates stress, stretches the spine, calms the mind, and encourages steady breathing. Looking to improve your posture? Cow Pose and the Cat-Cow stretch are yoga poses that can do just that. 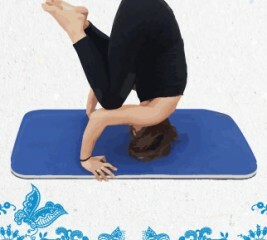 Additionally, cow pose helps strengthen the spine, stimulate stomach organs, work ab muscles, and calm the mind. See this and more Health Tips on our Facebook page.